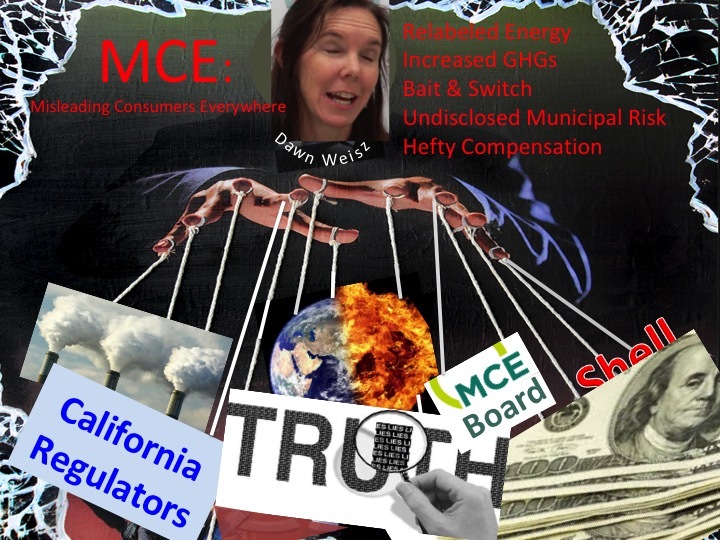 The history of MCE is marked by consumer deception and false advertising about the true cleanliness of the energy it delivers in the fight against global warming. 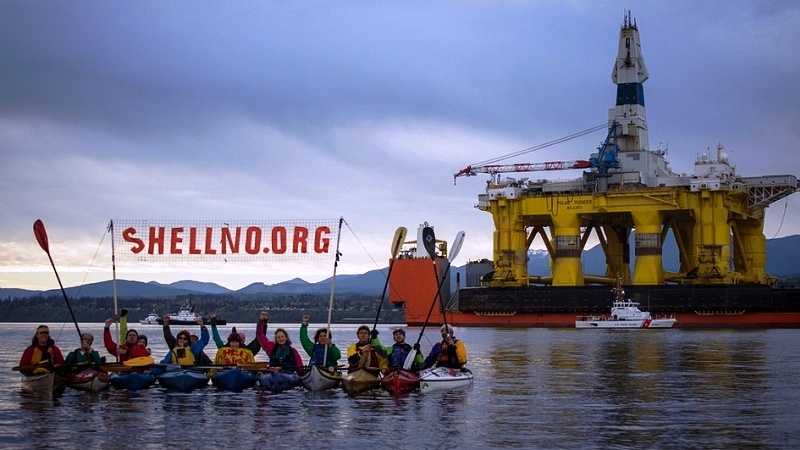 In 2015, in response to public criticism, MCE claimed it would sever ties with Shell Oil: that by 2017 it would be free of Royal Dutch Shell’s subsidiary Shell Energy North America. Following mounting public criticism, MCE also promised to cease its use of renewable energy certificates, known as RECs. This latter commitment garnered the support of the Sierra Club, whose attorney’s referred to the use of RECs as "deceptive marketing" when PG&E proposed using these instruments in its now-abandoned “Green Option” that was proposed to compete with MCE. In 2017, without fanfare, MCE’s full services contract with Shell expired. Long-time critics and environmentalists watched in anticipation for this new day to arrive, when the misdeeds and misdirections of MCE and its CEO, Dawn Weisz, might cease along with MCE’s exports of cash to Royal Dutch Shell in the Netherlands -- which, to date, top one-half billion dollars. However, with MCE there is frequently a caveat. Even though MCE announced it would no longer engage Shell with a “full-services” contract, a pipeline of energy purchases continued to flow to the oil giant. Those contracts ranged from $10,000 to a $27.3 million contract that Weisz executed last month. In a curious twist, MCE Chair Kate Sears was embroiled in a conflict of interest charge in late 2017, because she held Royal Dutch Shell stock while voting on MCE contracts with Shell. According to Supervisor Sears’ Form 700 filings with the County of Marin, she also holds stock in Exxon-Mobil, Phillips 66, Occidental Petroleum, BP, Total (French oil company), Conoco Phillips, Chevron, and oilfield services company Schlumberger. Nevertheless, with Shell’s departure as manager of MCE’s energy portfolio and energy scheduling, MCE was in immediate need of expertise to fill that void. MCE received six bids from firms that proposed managing MCE’s energy portfolio and scheduling energy deliveries. MCE awarded a contract to ZGlobalby unanimous vote of the board, in June 2016. Part of the justification for selecting ZGlobal was that it offered what’s known as “shadow settlement” services, which is a parallel reconciliation of the myriad of charges accrued during the delivery of electric power. Ironically, Weisz ducked a public question about shadow settlements in 2009, when she brought her MCE entourage to Novato, seeking support for the pending launch of her fledgling enterprise. MCE presumably conducted due diligence on ZGlobal, but it failed to identify that the company had caught the eye of investigators who were zeroing in on its conflicts of interest and double-dealing with southern California’s Imperial Irrigation District (IID). The Desert Sun, which was central to exposing financial improprieties, identified nearly $100 million in billings and now-cancelled contracts involving ZGlobal. Those issues remain open. ZGlobal will have a close relationship with MCE, particularly as pressure mounts for MCE to deliver on California’s growing requirement for increased energy volumes starting in 2021. These needs will include solar development, engineering, and procurement of energy from new renewable resources. Many of these areas are similar to those at IID. MCE’s selection of ZGlobal is telling of its decision-making and its peculiar attraction to companies embroiled in controversy. Previously, MCE became involved in a 120 acre solar development that failed, due in large part to less than competent management by MCE. North American Power Group (NAPG) was to construct a 15 megawatt solar farm outside Sacramento, in Rocklin, California. MCE’s technical consultant, Kirby Dusel (Pacific Energy Advisors, located in Folsom, California, where ZGlobal is also located) referred to the contract with NAPG as a “fleeting” opportunity when recommending Rio Solar to MCE’s board. In reality, Rio Solar existed only as a concept. While MCE’s technical consultants failed to grasp the multi-year time requirement for environmental reviews, MCE’s board believed Rio Solar was just months away from commercial production. After coming to terms with NAPG’s zero-progress, including a sudden announcement to relocate the planned solar farm 300 miles south to Bakersfield, Rio Solar was quietly cancelled by Weisz. The absence of Rio Solar’s energy was the equivalent of Marin County’s entireresidential electric load for three months. Contrary to its prior assurances, MCE covered the clean energy shortfall with RECs. MCE’s controversy was not limited to NAPG. MCE entered into a $190 million solar contract with a San Diego company by the name of enXco. MCE selected the firm over California’s SunPower and domestic supplier LSPower. Weisz was careful to refer to “enXco,” ignoring the identity of the company that actually owned enXco, when trumpeting the solar contract to Marin cities, during MCE’s update tour about MCE’s success. A firestorm ignited when Marin residents discovered that enXco was a subsidiary of Électricité de France (EDF), the world’s largest nuclear power company, headquartered in Paris. The uncovering of EDF, which should have been an embarrassment for Weisz, who also touted MCE’s rejection of nuclear power and calls for the closure of PG&E’s Diablo Canyon nuclear power plant, only galvanized her resolve about retaining her rightful place as MCE’s leader. MCE went on to execute a 20-year contract valued at $200 million for energy from "Desert Harvest." MCE's website, which identifies the 2016 agreement asResolution T2016-01 takes viewers to some other agreement. According to a table in MCE's 2018 Integrated Resource Plan, Desert Harvest is owned by EDF. To most public administrators, MCE's behavior would have been awkward for an agency that claimed transparency and community allegiance as justification for its existence compared to PG&E. For Weisz, a former county Planner earning $54,000 per year and now making $320,000 at the helm of MCE, all of this was simply noise as Shell faded from the headlines. ZGlobal marked the close to a public relations fiasco. With Shell’s departure, Weisz & company wiped their hands and declared they had delivered on what was promised to the public. Shell was gone. That box was checked… in pencil. Now it was time for Weisz to get back to work. There were issues involving MCE’s shifting positions on RECs; and operating costs that MCE and other CCAs had, for the time being, off-loaded onto PG&E. And, most urgent of all a looming threat to CCA independence and its “self-regulated” existence from the utilities commission that was beginning to piece together energy problems in California that were caused by CCAs. But first things, first. Weisz’s immediate priority was the continued shaping and controlling of the public narrative in order to better vanquish MCE’s critics. To achieve that, Weisz invoked a familiar posture that compelled her onlookers to take up a rallying cry, that caused local media to come to MCE’s defense, that compelled MCE’s board to circle the wagons around the MCE enterprise and cede its judgment to her. When MCE launched into business in May 2010, PG&E sent a letter alerting customers to be aware of a coming energy change, that they would be switched into a program known as Community Choice Aggregation. PG&E’s letter was information only -- neutral on the merits of CCA. Compared to MCE’s Opt-Out notice, the primary difference was that PG&E’s font size was large and easier to read, whereas MCE’s notice was small and had the appearance of junk mail. In response, Weisz acted as if she couldn’t believe PG&E’s egregious behavior. How dare the big utility company engage in these anti-CCA practices by sending such a letter. PG&E was acting contrary to AB 117, the law that created CCAs. Could the California Public Utilities Commission (CPUC) please help her reign in PG&E's anti-competitive actions? That plea prompted the CPUC to shut down PG&E’s conversation about the advent of CCA with its customers. If PG&E protested, the Commission was ready to levy heavy fines. And if any customers called PG&E with questions, the utility was to remain neutral while those customers were switched into MCE. Ironically, at the same time that the CPUC shut down PG&E’s voice, Marin consumers, who lacked an arbitrator, were complaining about MCE’s unfair Opt-Out practices. California legislators reacted to the shortcomings of CCAs, by introducing AB 2145. The legislation would change the Opt-Out mechanism to Opt-In, meaning consumers would have to take action and elect to sign up for the program, rather than automatically being enrolled, thereby eliminating concerns of gaming and manipulating the Opt-Out enrollment system. Of note, with the exception of three solar jobs that MCE claims, MCE has not created any on-going, full-time jobs in Marin, except those of its staff. MCE’s last cost savings compared to PG&E was six-hundreds of 1%, and its contribution to the renewable energy through the solar farms constructed through its "feed-in tariff program" is one-tenth of 1% of its total energy load. A feed-in tariff is where a developer funds the complete construction of a solar farm and then receives a guaranteed fixed-payment for each megawatt-hour of energy that is delivered to MCE for resale. Except for public relations, MCE’s feed-in tariff program has been a financial loss – MCE pays more than twicecurrent market prices for its feed-in tariff energy. To combat AB 2145 legislative efforts, Weisz again set up MCE as a victim to the CPUC and with State Senators in the Energy, Utilities, and Communications Committee. MCE claimed that private parties, including the International Brotherhood of Electrical Workers (IBEW), were distributing “very inaccurate and misleading information” about Shell and AB 2145. MCE also claimed that this writer, critical of MCE since it began green-washing dirty energy with RECs in 2011, was part of a scheme that threatened MCE’s growth. MCE asked the CPUC to shut down public discourse about MCE – a government agency-- and Shell and, most importantly, AB 2145. The IBEW’s letter responding to MCE is included here. Even though the CPUC did not act on MCE’s request, MCE successfully set the foundation for its showdown in Sacramento. CCA proponents packed the legislative chambers for a final vote on AB 2145. MCE told legislators that the Opt-Out mechanism was its birthright, and that MCE could not survive without it when everyone was spreading rumors and bad news about MCE. 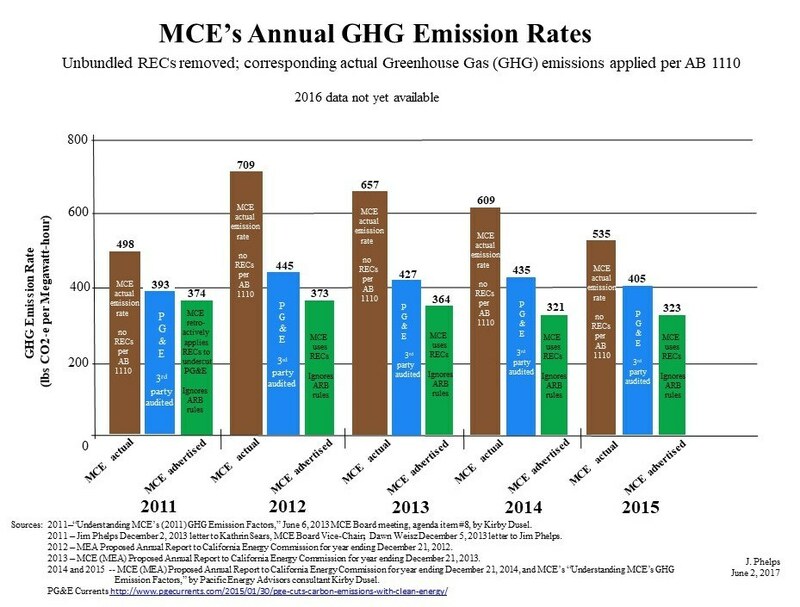 Besides, MCE claimed, communities everywhere were benefitting by its significant reductions of greenhouse gas (GHG) emissions compared to PG&E in the fight against global warming. (MCE averages 43% higher GHG emissions per megawatt-hour than PG&E from 2011 through 2015, the last year of available data). State Senators took the temperature of the room and determined their re-elections were better assured if they didn’t alienate voters. AB 2145 was defeated, preserving CCA’s Opt-Out / automatic enrollment program. MCE’s board is comprised of municipal councilmembers from each city or town that MCE serves. None of the members are energy professionals and so they rely on MCE staff for technical guidance. Competent boards require a rudimentary understanding of the business they govern. According to MCE’s board meeting minutes from June 2014, the board did not understand even the basic component of renewable energy, known as “Bucket 1.” This was after four years of operations. This meeting occurred after MCE was exposed for doctoring its annual greenhouse gas emission rates after PG&E’s unexpectedly lower number was published. Two years later, MCE was again exposed for importing coal-fired power that it rebranded as “clean” energy. In both cases, Weisz authored letters that obfuscated the truth and kept her board of non-energy professionals in the dark. If there was any hope of someone directing MCE to begin operating with integrity, it wasn’t going to come from a board that took its cue from its CEO. It is doubtful that Weisz shared thoughts with her board that were similar to those of California Air Resources Board Chair, who, five days later, wondered if MCE was engaged in consumer fraud. In her second letter, Weisz denied that MCE’s import of “clean” coal-fired power had occurred, then claimed it was all “unexpected and unfortunate” misunderstanding before blaming Shell and the California legislature for her problem. It remains unclear whether Weisz fully grasps what occurred involving coal imports and associated Bucket 2 e-tagging issues, because even though she signed the September 2015 letter, according to invoice records, it was authored by her consultant at Pacific Energy Advisors. All agenda items and the vision of MCE fall to Weisz. Of the thousands of agenda items that board has considered since MCE’s May 2010 business launch, not a single “no” vote has been cast by any single member on any single item. The odds of this occurring in a company that is fully disclosing all aspects of its operations and decisions is probably zero. Of note, MCE’s board is now 28 strong, 10 more than the largest corporate board on record – General Electric Company, which recently announced its board is downsizing to 12 members (the most recent enterprise value of GE is $243 billion). Part 2 of this series will address (1) MCE’s cash horde; (2) MCE’s public rejection of RECs and its concurrent use of a front organization that lobbies for their continued use; and (3) MCE’s quid pro quo outreach where jobs are promised in exchange for favorable public relations in its coming fight with legislators and utility companies. Jim Phelps is retired after serving the power, petrochemical, and geothermal industries for nearly 35 years as a power contractor and utility rate analyst. He is not now, nor has he ever been, employed by PG&E. He has not received any money from PG&E for his work tracking Community Choice Aggregation and Community Choice Energy activities. He has also completed consulting and thermal performance test work for Shell Oil, one of MCE's energy providers, at one of Shell's Gulf Coast refineries. Mr. Phelps operates one of Marin's largest residential solar electric systems at his home in Novato. He also operates a solar electric system at another house in Placer County. Several years ago he initiated contact with PG&E about its carbon emission practices and with MCE about its emission practices. He also requested clarification from MCE and other CCAs about several business conduct issues, however, those CCAs declined to provide help. To this time, MCE’s only input about its business is to respond to Public Records Act requests identifying the costs for copies of public documents, or denying the existence of basic information, such as its procured volumes of system power.